UPDATE: Script & Style is closed, but an updated version of this article is now on David Walsh's site. 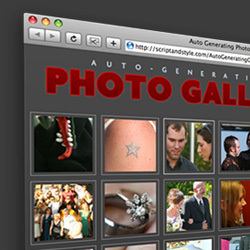 Just a quick note that I wrote up a tutorial (with demo and download) on how to Automatically Generate a Photo Gallery from a Directory of Images as an exclusive for Script & Style. I'd like to encourage folks, if you have a cool idea for a tutorial you want to write, to pitch it to me. I'd like to start paying people for cool exclusive tutorials, but rather than just set a flat rate I'd rather base it on the complexity/length/effort/coolness of the tutorial. Send in your idea at the Script & Style contact form. You rock! Thanks Chris. This is just what I was look for. This was a great tutorial. I didn’t use it exactly as it was presented but, there were lots of little things in there that proved useful for my project. Keep up the great work. This site and the screencasts have really been helpful in terms of understanding site design and good coding techniques. Cool. A month ago I looked for a good solution, I ended up with an ugly php-script. Now you came along with a much more satisfiying solution.